As a new contributor to Bikocity, I will be focusing on a return to the simpler days of mountain biking. Lately mountain bikes have become as expensive as motorcycles. They come loaded with all manner of technological advances most riders may not need. The backlash to this is a growing trend toward a return to simpler times. Riders have been scouring Craigslist for vintage bikes, converting bikes to coaster brake, even building minimalist single speeds. Some riders even follow the one bike philosophy by only riding their multi-purpose gravel/cx/adventure/touring bike. Although this category will be called “This is My MTB”, you will rarely see something that a big company’s marketing department would consider a mountain bike! That’s not to say that they haven’t taken notice. At Interbike this year, we saw many brands offering multi-purpose steel bikes. We think this segment will continue to grow and that you do not need an expensive single-purpose machine to enjoy the ride beyond the pavement. 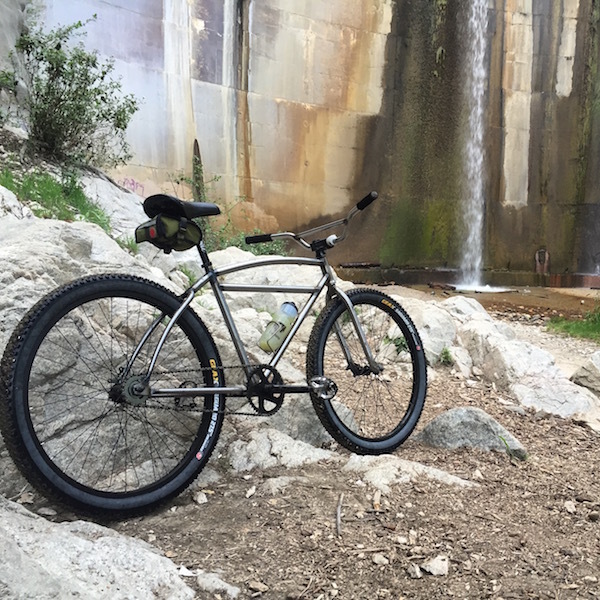 Photographed above is Hank, an all-purpose steel bike that takes me from the mean streets of Los Angeles into the Angeles National Forest where it’s photographed. Hank was developed by Asylum bikes to meet this need for a fun, simple bike that can go anywhere. Commuting to trail from the office will feature prominently. We will also feature some off-beat renegade mountain biking parties like the ones hosted by our friends at Atomic Cycles. Stay tuned! Robert lives to ride. He's been riding mountain bikes since the 90's and fixies on the streets of LA for over a decade. He knows a lot about vintage bikes, building custom bikes, and riding everywhere.